In our neighborhood in Santa Ana, approximately 5% of the garages were able to accommodate vehicles. Instead, most were packed to the gills with miscellaneous stuff [read: junk]. A few had been converted into bunk houses or additional living rooms. We had a semi-useful garage. One car fit perfectly but an after market tool bench limited the second space to non-car uses such as motorcycle storage, Bailey's kennel and other 'stuff'. Personally, I'm a fan of garage parking, especially in rainy Seattle. I dislike scraping my windows during freezing weather and lugging groceries through a downpour is never ideal. So this time around we were determined to use our garage for cars, not junk. Unfortunately, that left little room for my assortment of garden tools, pots, and machines (lawn mower, weed eater, etc). Time for a garden shed! We decided to resurrect the old greenhouse in the back yard. We didn't even know it was an old green house, just something, buried under the mass of ivy. Bailey had fun digging around. He carved out a few tunnels and investigated the nooks and crannies. A black dog! Under all that ivy! Still alive, after all those years! Ha. Just kidding. We have discovered a lot of bones, though... Moving on, we uncovered a three-sided cinder block structure. Talking with the former owner, we learned that it was once a greenhouse. Judging by the amount of broken glass that we removed from the soil, it must have been a massive greenhouse. Its main purpose, once completed, will mostly be as a garden shed. It will have a chicken coop component and possible future accommodations for some lovely goat ladies. We'll see. 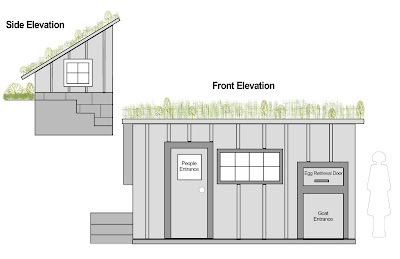 We'd also like to put a green or living roof on, much like my parents have on their garage. Measure twice, cut once. We learned this the hard way. :) Faithful helper/chicken herder. Every used a concrete drill? Me neither. It was an experience. Pounding in the floor joists. Looking good, Megan! Chris and Eric ended up doing most of the measuring/hammering/cutting of the plywood flooring The last piece of flooring was tricky as it required a jigsaw cut. The boys were awesome though and it fit perfectly. The floor is now done! Keeping the troops occupied is a tough job. Bailey shows off his mad foot herding skills. you hyperlinked my name to my twitter. That's awesome!